My favorite diner food has got to be the hash brown. The long wait at the diner on Saturday and Sunday mornings are usually worth it to get some crispy-browned hash browns. But why wait when you can make them at home! A food processor makes this recipe a breeze, but if you feel like getting in a morning workout, feel free to use a box grater to shred the potatoes. Be sure to shred the potatoes right before cooking so they don’t turn brown. 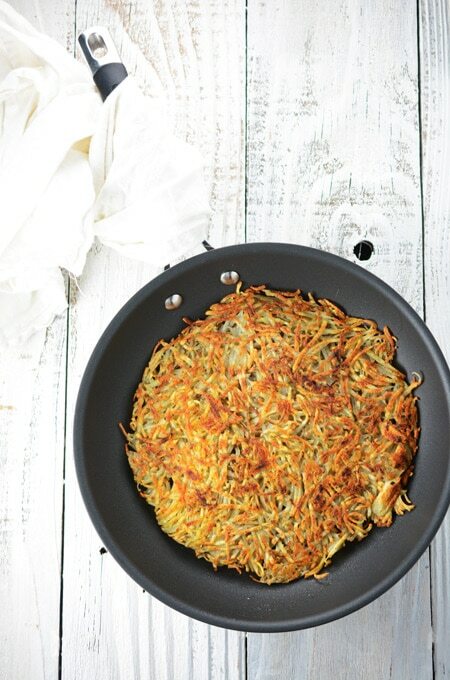 Wrap the shredded potatoes in a kitchen towel squeeze to release any excess moisture. Toss the potatoes with 1/4 teaspoon salt and pepper and set aside. Melt 1/2 tablespoon butter in a 10-inch nonstick skillet over medium-high heat until it begins to brown, swirling to coat the skillet. Scatter the potatoes evenly over the skillet and press to flatten. Reduce the heat to medium and cook until dark golden brown and crisp, about 7 to 8 minutes. 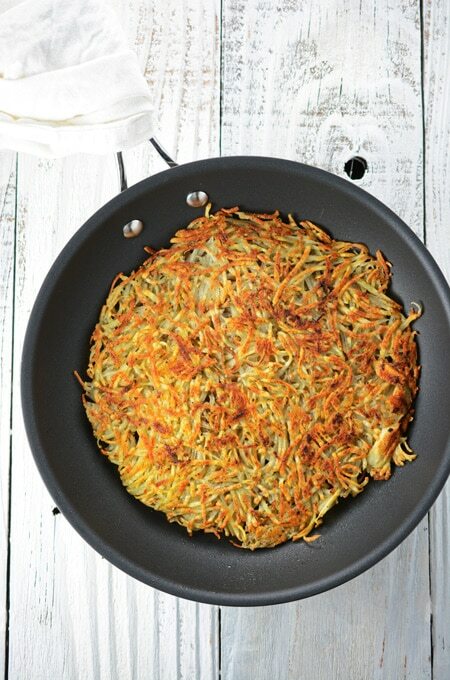 Slide hash browns onto a large plate. Add the remaining 1/2 tablespoon butter to the skillet and melt, swirling to coat the pan. 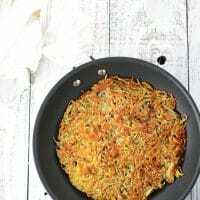 Invert the hash browns onto a second plate and slide, browned side up, back into the skillet. Continue to cook over medium heat until the bottom is dark golden brown and crisp, about 5 to 6 minutes. 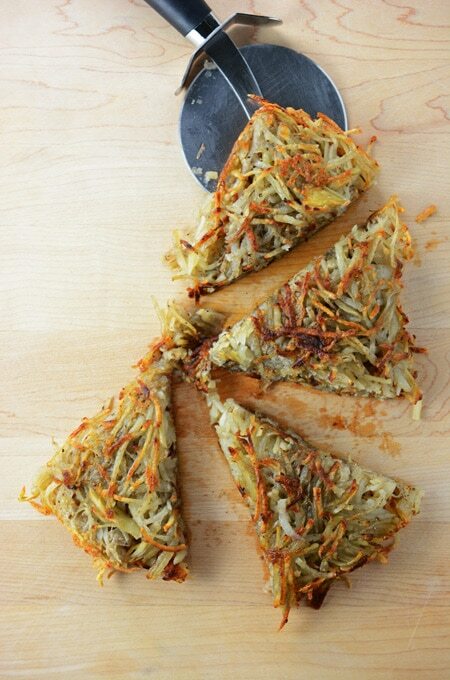 Fold the hash brown cake in half and cook for about 1 minute longer. Slide onto a serving platter or a cutting board and cut into wedges and serve immediately.